At the end of the Seventeenth Century, London became a city full of promise, the stuff that dreams were made of: theatres and concerts were packed every night and the music publishing market was flourishing. This great European capital at the height of its economic expansion was extremely attractive to the foreign musicians who settled there in large numbers. It provided a most favourable context for the development of instrumental music, fuelled by the final flowering of the English tradition and by the latest European innovations. 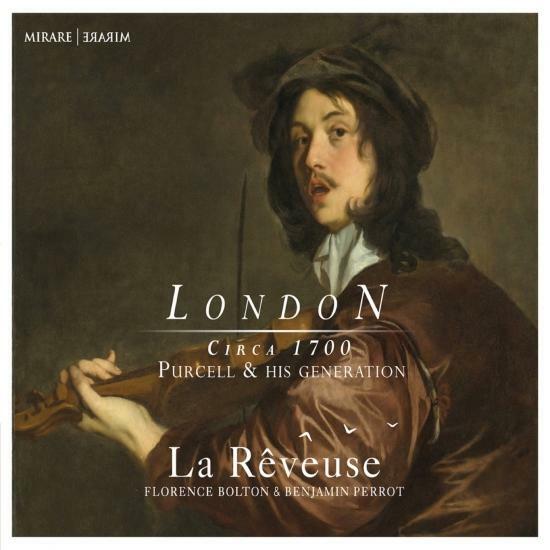 Founded by Benjamin Perrot and Florence Bolton, La Rêveuse is a flexibly sized ensemble of solo musicians which aims to bring back to life selected works of the seventeenth and eighteenth centuries. It has attracted favorable attention with its concerts in France and abroad, while its recordings on Mirare and K617 have all been acclaimed by the French and international press (f de Télérama, CHOC de Classica, Gramophone, Early Music Review, etc.). Wishing to forge links between the different artistic disciplines, La Rêveuse has worked since its formation in close collaboration with the world of the theatre. In particular, it has taken part in a number of spectacles with Benjamin Lazar, Louise Moaty, Catherine Hiegel and François Morel, the visual artist Vincent Vergone (Cie Praxinoscope) and Nicolas Vial. Its strong desire to share with every type of audience the humanism, beauty and culture of the seventeenth and eighteenth centuries has led La Rêveuse to develop over the past few years a series of individually conceived concert-lectures bringing out parallels between music, literature, painting and heritage, in collaboration with Jean-Philippe Guye, Professor of Arts and Civilisations at the Conservatoire National Supérieur de Musique de Lyon. The ensemble is also committed to educational and outreach projects covering these subjects with primary and secondary school students. Its most recent project, Les Lettres persanes revisitées, with adolescent and adult newcomers to the field, was a finalist for the Prix de l’Audace Culturelle et Artistique 2016 (Fondation Culture & Diversité). Its most recent productions have included Jack et le Haricot Magique, a musical fairytale in collaboration with Kristof Le Gar ; Molière/Lully’s comédie-ballet Monsieur de Pourceaugnac with Le éâtre de l’Éventail (Raphaël de Angelis); Ba-Rock!, an ‘unplugged’ concert focusing on English-language song from Dowland to Sting; and L’Heure verte, a cabaret show combining polyphonic airs with contemporary compositions by Vincent Bouchot, directed by Nicolas Vial. La Rêveuse is currently working on a book-CD project devoted to two great artists of the early eighteenth century, Marin Marais and Antoine Watteau. La Rêveuse receives support from DRAC Centre - Ministère de la Culture, the Région Centre, the City of Orléans and the Fondation Orange. It is a member of the professional bodies FEVIS (Fédération des Ensembles Vocaux et Instrumentaux Spécialisés) and Profedim (Syndicat professionnel des Producteurs, Festivals, Ensembles, Di useurs Indépendants de Musique).